Does Lasagna Cook Faster Covered With Foil? Make lasagna ahead of time and enjoy for dinner later. 2 Do You Need to Boil Fresh Egg Pasta for Lasagna? 4 Do You Have to Cook Lasagna Before Freezing if You're Using Eggs? 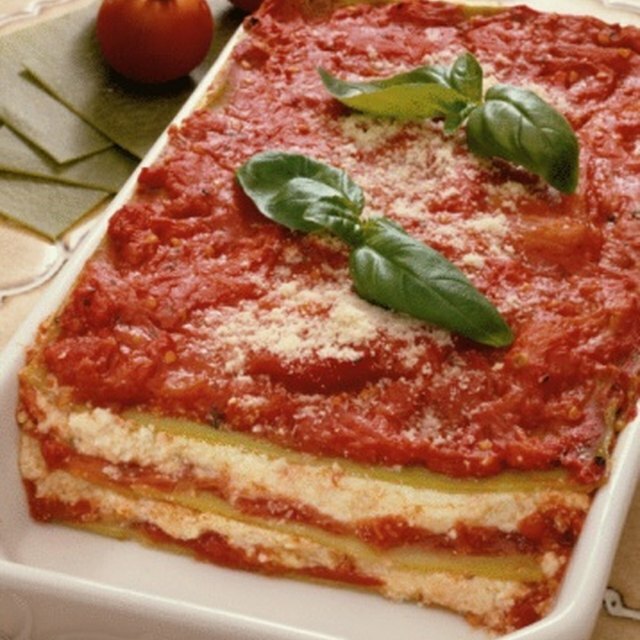 Lasagna is a meal by itself and, when combined with salad and breadsticks, becomes a feast. This delightful dish is tailor-made for preparation today and enjoyment tomorrow. Prepare and freeze lasagna for the future, or place it in the refrigerator for dinner the next day. Follow the FDA Food Code and heat lasagna correctly to protect your family and guests from illness after they enjoy a delicious meal. Maintain food safety and quality by heating food correctly. Thaw previously-prepared and frozen lasagna overnight in the refrigerator. Place the lasagna onto a baking pan, loosely cover it with a sheet of aluminum foil, and slide it into the oven. Bake the lasagna the same temperature the recipe directs for the original baking. Heat the lasagna to a temperature of at least 165 degrees Fahrenheit for a period lasting at least 15 seconds. The lasagna must be heated within two hours of removing it from refrigeration. Measure the temperature with a stem thermometer, inserted through the foil into the center of the lasagna. Use small shallow pans when making lasagna for future use. The lasagna is faster to heat up, maintaining its quality. 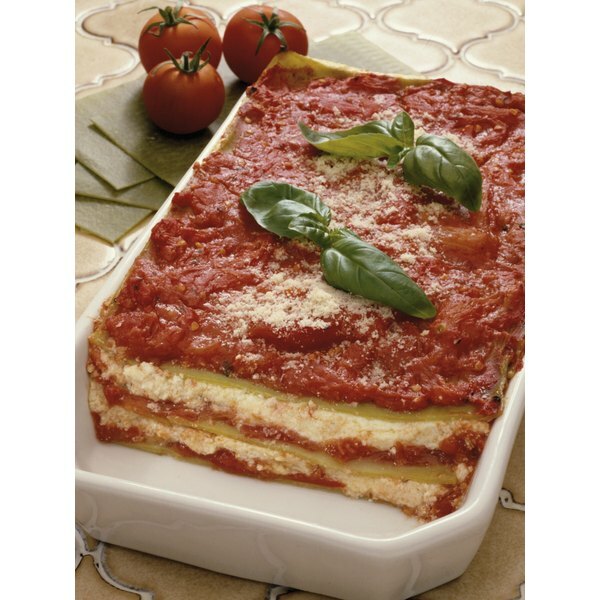 Fully-cooked frozen lasagna heats extremely well when baked at 400 to 165 degrees Fahrenheit. Use frozen lasagna within three months of it freezing for best results. Freeze lasagna within a period of two hours, to avoid large ice crystals forming in the casserole. Microorganisms begin to multiply between 41 to 165 degrees Fahrenheit.